(Nanowerk News) Scientists at the US Department of Energy’s Oak Ridge National Laboratory are learning how the properties of water molecules on the surface of metal oxides can be used to better control these minerals and use them to make products such as more efficient semiconductors for organic light emitting diodes and solar cells, safer vehicle glass in fog and frost, and more environmentally friendly chemical sensors for industrial applications. In a set of papers published in the Journal of the American Chemical Society ("Structure and Stability of SnO2 Nanocrystals and Surface-Bound Water Species") and the Journal of Physical Chemistry C ("Vibrational Density of States of Strongly H-Bonded Interfacial Water: Insights from Inelastic Neutron Scattering and Theory"), the team of researchers studied cassiterite (SnO2, a tin oxide), representative of a large class of isostructural oxides, including rutile (TiO2). These minerals are common in nature, and water wets their surfaces. The behavior of water confined on the surface of metal oxides readily relates to applications in such diverse areas as heterogeneous catalysis, protein folding, environmental remediation, mineral growth and dissolution, and light-energy conversion in solar cells, to name just a few. 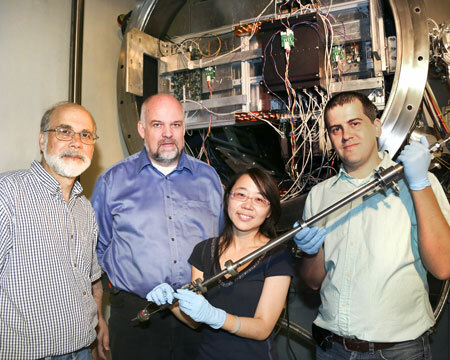 Pictured at the NOMAD instrument at Oak Ridge National Laboratory’s Spallation Neutron Source are David Wesolowski of the Chemical Sciences Division, Thomas Proffen of SNS, Hsiu-Wen Wang of JINS, and NOMAD instrument scientist Mikhail Feygenson. Wang and Feygenson are holding the NOMAD sample-mounting wand. “When we drive all the water off the surface of the nanoparticles, this destabilizes the structure of the nanoparticles, and they grow larger,” said David J. Wesolowski, a co-author and Wang’s supervisor when she worked in CSD. “It may be that the surfaces without water have different and useful chemical properties, but because water is everywhere in the environment, it is very important to know that the surfaces of oxide nanoparticles are likely to be already covered with a few molecular layers of water,” Wesolowski said. “The results are significant in demonstrating many new features of surface-confined water that can provide general guidance into tuning of surface hydrophilic interactions at the molecular level,” said Jorge Sofo, professor of physics at Pennsylvania State University.